This Char Broil Classic 4 burner gas grill review will show you why this is still one of the best sellers in 4 burner gas grills from the Char Broil Company. We have found over 1100 reviews of this grill and it still has an average of 4.3 stars out of 5. Although the infrared gas grills becoming very popular there is still a of people who like to use this classic 4 burner gas grill. It is always important to know how much space there is on a grill. The Classic 4 burner comes with 480 sq/inches primary grill surface and as 180 sq/inches secondary space on a swing away grate. We have mentioned many times before that you need an average of 72 sq inch per person you cook for if you cook a full meal including meat, veggies etc. This means that the Char Broil classic can handle 480/72 comes to 6 or 7 people. If you would use the warming rack to cook for example baking potatoes or other side dishes it can even be a little more. For burgers we need about 20 square inches and that would be about 24 burgers at the same time. But I always advise to use only 75% of the grill space to make it possible to move things around. So, this would still mean you can cook about 18 burgers at the same time. 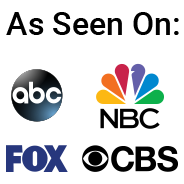 Click on the image to see a large picture. What I like is that both the main grill grate and the warming rack grate are porcelain coated. The main grill grate is made of cast iron and the warming rack, I am not sure, but I think it is steel. This makes both of them easy to clean. After using the grill, just turn it up to high and let it burn of the residue of the grill grates. After that just scrape it with a wire brush and most of the time you are done. Every once in a while you should take the grill grates of and clean the bottom part. Other features are the large wheels for easy moving it around and the very sturdy side burner. It is impossible to read all the reviews we have seen on many consumer websites and forums about this grill. We will try to tell about the pros and cons in the next portion of this review, but here are some thing we found out about the Char Broil classic 4 burner gas grill. Let us start with the number of stars in the rating. Let’s see what the 1 and 2 star raters say. Came damaged in the box. This has nothing to do with the quality of the grill, bur with the shipping company. Grill grates rusted after a while. I have porcelain coated grill grates on my grills and never had a problem with them in many years. Must be a quality issue. Send back and ask for new ones. Burners and whole grill rusted to fast. Got no idea if the used a grill cover or not. Can not comment on this. Temperature controls do not work, only high or very high. Send it back and as for refund or new grill. Bottom catches more grease and will set on fire after a while. The 4 and 5 star ratings. Assemble instructions are not to good. For the rest there were only positive thing to say about this grill. The temperature can be regulated good and the grill can be used for indirect cooking if you use the burner on the side only. That the wheels do not come with a lock mechanism was mentioned as a little annoying, but no to bad. 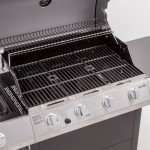 It is hard to give this Char Broil classic 4 burner gas grill a rating. It seems that this grill is build in China and we all know that that comes with a lesser quality in many cases. Most of the people (almost 85%) gives it a 4 or 5 star rating and is happy with it. I think you have to look at in a way that you get what you pay for. If you compare this with a 800 dollar infrared grill from Char Broil or a Weber in the same price range, this grill is not too good. If you compare it to a cheaper unknown brand in a big box store this is a great grill. Depending on how much you use it and how you baby it I think this is a pretty decent grill for what you pay for it. There are the occasional lemons that are shipped out, but that is what you have your warranty for. No one like to assemble and then take it apart and send it back and luckily I have only read that a few times in all the over 1100 reviews. Overall I can recommend this grill as a good deal for the money you pay for it, but do not expect a quality like you would expect from a grill in a much higher price range. We always recommend a good grill cover for any grill. 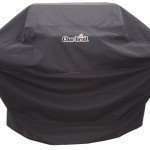 We have reviewed the Char Broil 3 and 4 burner grill cover that will fit this grill. This grill on Amazon can also be ordered with the grill cover. Most people are pretty happy with this grill and will buy it again for this price. Tips we read was to keep it covered to make it last longer. Try to find a solution for the grease pan that is bigger, this one if full in no time. Although not so easy to do, try to cover the bottom with alum-foil to protect it from the grease falling on it. Read all our Char Broil grill reviews by looking at the menu!